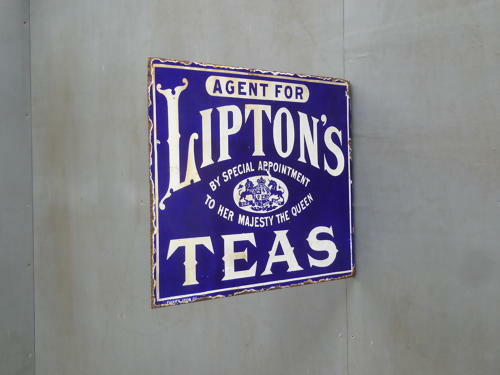 A beautiful example of an antique enamel advertising sign for Liptons Tea. A wonderful & very early version of the iconic Liptons Tea signs, double sided in a striking cobalt blue & white colourway & with a fantastic Royal warrent crest. Manufactured by The Falkirk Iron Company, a rare survivor, perfect for the home, cafe or restaurant. Wear commensurate with age with good gloss & depth of colour. Both sides of the sign are extremely good for a sign od this age, the flange has suyffered a little over the years but remains solid & usable.